Gylfi Sigurdsson to Everton: A hit or a miss? Gylfi Sigurdsson to Everton has got mixed reactions from the world of football. While some fans are lauding Ronald Koeman for pulling off a brilliant coup, there are others who have openly criticized the Dutch manager for his inexplicable transfer dealings this summer. Whatever the opinions are, Everton would now be finally relieved that they have got their man. The Gylfi Sigurdsson to Everton transfer has broken the club’s transfer record which now stands at £45 million. In an interview with the The Guardian, Sigurdsson said that he has fond memories of the Goodison Park visit when he was a 11-year old and was delighted to be back at the ground which he visited during his childhood. He has also spoken about his ambitions with the new club and his desire to win more trophies. His fellow team-mate Ashley Williams described him as a player with excellent off the ball movement. He also added that he pops up with an assist whenever needed. Gylfi Sigurdsson started his senior career with Reading and sealed a move to 1899 Hoffenheim in 2010. His first experience of Premier League came when he joined Swansea on loan in 2012. Six months later he moved on to Tottenham in a £6.8 million deal. In 2014, he moved to Swansea where he was voted player of the season for 2 consecutive seasons. Over the course of his senior career, Sigurdsson represented Iceland in 50 matches. He also played an instrumental role in the famous run of Iceland in Euro 2014. Sigurdsson has played in 8 positions over his career. He has played as secondary striker, left midfield, right midfield, attacking midfield, left wing, right wing and centre forward. His impact in the attacking midfield position behind the striker has been his most impressive display. 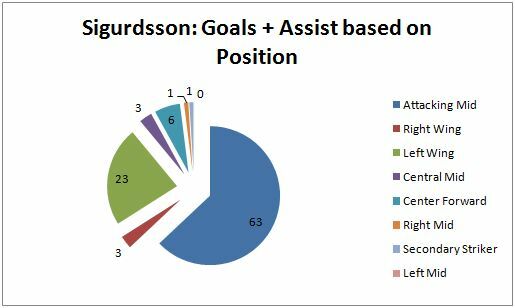 The above stats makes it apparent than more than 50% of Sigurdsson goals and assists have come from the attacking mid field position behind the striker. He has managed to score 36 goals and has provided 27 assists from the attacking position. Everton now seem to have added to the attacking midfield punch from previous season. With the addition of Sigurdsson to Everton, the depth of the squad has increased. This will give Ronald Koeman a chance to make a switch in the formation when necessary. Everton FC can play 4-2-3-1 formation or switch to 4-3-3 or 3-5-2. This is possible due to the arrival of quality players such as Davy Klaassen, Ramirez, Gylfi Sigurdsson and Wayne Rooney. For example, against Potters, Koeman started with a 3-4-3 formation but switched to a 3-5-2 formation to give an added defensive strength against Manchester City. Gylfi Sigurdsson started on the bench but replaced Davies against Manchester City in the second half. Sigurdsson’s ability with the dead ball would also aid Everton in getting that extra edge in critical situations. In the last season, Sigurdsson managed to score 9 goals and has provided 13 assists, being involved in 48.9% of Swansea’s goals last season. Everton’s spending has reached a record high of £130 million this season with Sigurdsson’s transfer. Many have criticized the signing of Sigurdsson for an inflated price tag from a club that was battling relegation last season. But one look at Sigurdsson’s stats give us a valuable argument as to why the record transfer might be justified. Only four players have racked up more assists than Sigurdsson in the last 3 seasons. Also, Sigurdsson has scored more direct free kick goals than any other player since 2011. He has been very active in midfield with a lung busting 433 Kilometres covered last season, more than any other player in any other position. He was the second highest goal scorer against the top 6 sides last season and provided the most assists from a dead ball situations in the Premier League last season. These statistics are enough to convince critics of his worth. Even though his performance for Swansea was impressive, his stint at Tottenham was a big failure. This raises some question over the transfer purchase by Everton. Sigurdsson had said that his performance at Tottenham was poor owing to the fact that he was played out of position at White Hart Lane. When he made a switch to Swansea, manager Garry Monk played him in his preferred position leading to a boost in his performance. Ronald Koeman has been willing to sign Sigurdsson since his time at Southampton and is now delighted to work with the midfielder. Everton are aiming Champions League qualification this year and the addition of some good players would help them in challenging for the qualification. The experience of players such as Wayne Rooney, Gylfi Sigurdsson, Jagielka and Baines is definitely going to play a huge role for Everton this season. But will Gylfi Sigurdsson to Everton FC be a hit or a miss? 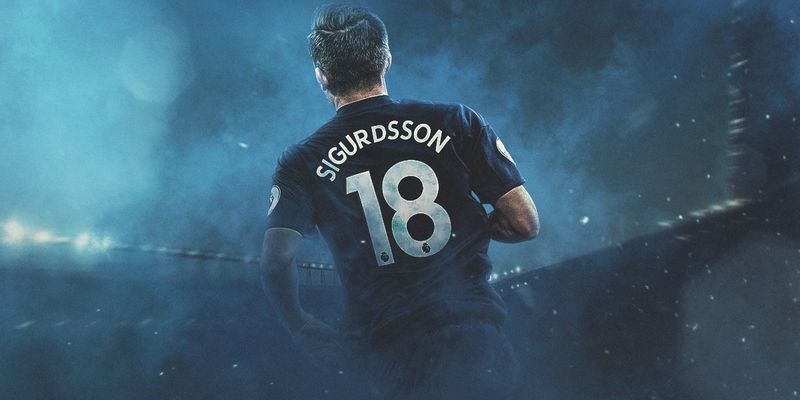 Sigurdsson is no doubt a good addition to the midfield and possesses the ability to power up Everton attack but his success will depend up on how he is utilised at the club.